T-Mobile Offers Free Hotspot Use in La., Miss., Ala.
Who's Hot Today? Rome, Geor. ; Kingsport, Tenn.
Winnipeg, Manitoba (Canada), adds Wi-Fi to airport: The Winnipeg airport just launched its Telus-operated network after six months of build-out. The service is being used for operations, public access, and merchant activity. Posted by Glenn Fleishman at 11:04 AM | Permanent Link | Categories: Who's Hot Today? Toshiba's MyConnect service looked until today like just another branded GoRemote offering: But Toshiba has upped the ante in competing with other aggregators and service providers by adding a $3.95 per hour option for on-demand use. Because GoRemote has tens of thousands of hotspots, wired locations, and dial-up numbers, this is an interesting option for travelers who want on-demand service and aren't part of a larger negotiated network offering provided by GoRemote, iPass, or FiberLink to a corporate employer. Toshiba's MyConnect has several service plan offerings, with the $9.99 activation charge and $3.95 per hour (rounded to nearest hour) option being the cheapest and least to manage. They also offer recurring and prepaid plans. The $39.95 per month unlimited usage plan--across dial-up, wired, and wireless--has no cancellation penalty. The $39.95 option including dial-up contrasts nicely with Boingo Wireless's larger hotspot footprint (but few wired hotel rooms and no dial-up) offering at $21.95 per month unlimited usage, and FreedomLink's retail $19.95 per month offering for Wi-Fi on their home network only. FreedomLink and Wayport locations are included in the GoRemote network that Toshiba is reselling. All service plans offer a $4.95 per hour surcharged (and rounded up to nearest hour) toll free dial-up offering, which is not a bad last-resort option, as I've found on many trips. Boingo now roams to Opti-Fi airports: They operate 28 Wi-Fi networks at airports and airline gates, including some high-traffic locations. Boingo's deal gives them access to a few dozen more airports in the near future. Opti-Fi handles AirTran's Wi-Fi service. Boingo says their North American airport total is now 93; worldwide, 169. Pooled studies from several countries show no increased risk of acoustic neuroma: This form of tumor was seen as most likely to be the result of exposure to an adjacent cellular phone. The British Journal of Cancer has published the study review which shows no substantial risk--meaning no statistically significant correlative factors--in cell phone use in the first decade of use. Given that phones produce less and less signal strength as they've moved to more sophisticated digital technology, this should reduce any remaining potential harm over a longer term. Study authors and cancer charities in England recommend continuing to follow the issue to examine whether risks exist over periods longer than a decade of use. Given that cell phones use substantially more power than Wi-Fi and are concentrating their signals much closer to the brain, this is another good piece of positive information in reducing concern that Wi-Fi and similar technologies have any effect on human health. T-Mobile HotSpot steps up to the plate in hurricane-thrashed region: As the company has in previous disasters, they've opened their hotspot network up to free usage for the next week, with a potential extension. While folks displaced from their homes aren't necessarily going to all have laptop computers, there are stories from previous such events that everyone shares--cell phones, cars, computers, whatever they have that can help a stranger in need. I hope that other hotspot operators will also step up to bat. There's nothing like helping people reconnect with family or even conduct business--getting the region back on its feet sooner--than Internet access these days. Pastor rotates among Wi-Fi hotspots to meet flock: Steve Mullins meets with parishioners and gets his work done at Borders, Starbucks, and elsewhere because he doesn't have a church office. The reporter on this piece drove 350 miles to test Wi-Fi in several Florida counties, and had good experiences. Addison, Texas, lights up its network: The citywide network launched Tuesday in this Dallas suburb. The mayor note sin this Austin American Statesman article that they are the first citywide wireless city in Texas. A quote from an Institute for Policy Innovation's Barry Arons sets the wrong tone, though: "I find it to be a very, very severe problem and very unsavory when the city says this will be the only game in town, and it will be financed and operated by the taxpayers," he said. Arons didn't mind Addison's private-public partnership with RedMoon, which built and is operating the network. But I'd like to see Arons and others both pro and con on the municipal wireless front be less soundbite-like about the "only game in town" part. I haven't seen any plans in which the city or town becomes a monopoly. I have seen some plans in which private companies will receive access to utility and city facilities, like poles, conduits, and building tops. Whether that's exclusive or reduced rate really defines whether a givne network is economically viable as the only game in town. 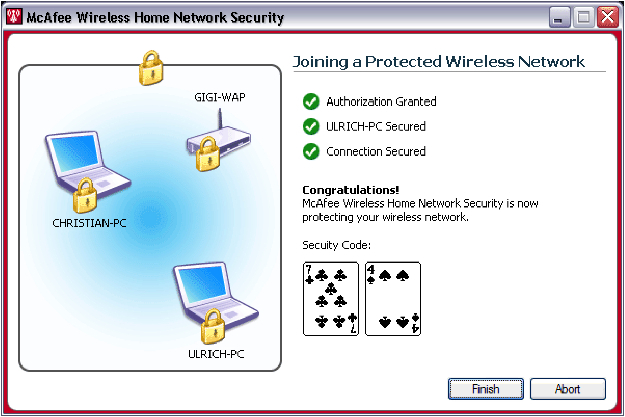 The fruits of McAfee's purchase of Wireless Security Corporation appear in Wireless Home Network Security 2006: The $49.99 security package uses WEP, WPA Personal, or WPA2 Personal to secure up to five personal computers and one or more access points with virtually no user configuration. WSC, prior to its McAfee buyout, focused on small-to-medium-sized businesses (SMBs), and had built modules that let them automatically configure access points to work with their proprietary security software that uses WPA Enterprise to secure a network. These modules come into play in WHNS 2006 as popular models from Belkin, D-Link, Linksys, and NetGear can be reconfigured to handle a new encryption key without any user fiddling. Stu Elefant, senior product manager at McAfee for wireless and home networking technologies, and the former VP of marketing at WSC, said the software starts out by generating a long and strong encryption key for the user. "They don't need to know about keys; they don't need to think of a random passphrase," Elefant said. The software installs on Windows 98SE, Me, 2000, and XP systems, and both generates and manages a shared key. Its elegant interface replaces the Wireless Zero Configuration (WZC) approach built into Windows XP and is a great front-end for the other Windows platforms that lack a good inclusive Wi-Fi detector due to their age. When the software is fired up, it detects an insecure local network and tries to reconfigure it. It uses WEP first, but in a nod to WEP's broken nature, the software also, by default, changes the shared network key every three hours using a distributed schedule instead of a RADIUS server re-authentication. This can be disabled, and WPA or WPA2 can be turned on by more sophisticated users on networks on which all adapters and the gateway can handle those stronger methods. You can also use the tool to set everything up, then extract the hexadecimal network key, suspend rotation, and manually enter that key on non-supported computers. No one computer acts as the central manager. Rather, you set one computer up which reconfigures one or more gateways. When you fire the software up on an additional computer, it launches an ad hoc network to which any already configured computers will join. Using a secure tunnel, the already-configured machine hands some tokens back and forth for an out-of-band confirmation check. McAfee decided to use two playing cards to allow confirmation. 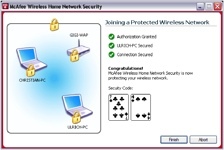 The computer joining the network and any computer already configured will display the same two playing cards to confirm that there's no man in the middle. On approving the new machine, it becomes part of the lightly distributed system, passing event information back and forth with other comptuers, and able to reconfigure the base station or add new machines. You can't revoke access for a single machine, but you can force a key rotation for all currently connected computers. This rescheduling of rotation prevents any previously connected machines that aren't on the network from reconnecting. The $49.99 covers a 12-month license for receiving definition updates for the Wi-Fi gateways that the software supports for automatic configuration; renewal will be $9.95, Elefant said. In a nice move, McAfee provides tech support via Internet chat 24 by 7 at no cost. The product can be purchased online for download now. A shrinkwrapped version will ship in September for retail stores. A three-user version of the software will be bundled as part of McAfee Internet Security Suite ($149.99) and VirusScan/Personal FireWall Plus ($99.99) in mid-October. An additional set of five users can be managed by purchasing another $49.99 copy of the software. Elefant noted that part of McAfee's interest in acquiring WSC and part of the drive to release this product stemmed from the wireless security scan site that WSC built for McAfee early this year had 60,000 uses before the free tool was marketed. There's a link in this home product to the security scan, too. McAfee continues to sell WSC Guard and derivative products under their original names; they'll be integrated into the small/medium business products group in the future. Rome, Georgia's library and garden puts in free Wi-Fi: They're working on a downtown network, too. The library's costs seem remarkably and sensibly low. Kingsport, Tenn., lights up downtown: About 80 percent of downtown Kingsport has free Wi-Fi courtesy of the city pilot project. The test will last about a month. A local firm put in the network free of charge for this phase. My friends at Wirelesstrips.com have added a hotspot finder for recreational vehicle travelers: The rag-tag band of two parents and four kids and some pets roam the country from their base in Maine, and run their various electronic businesses while on the road. Internet access for the Adair-Hoy clan is critical. Richard has used Google Maps open interface to build a mapped directory that shows locations that have Wi-Fi and can handle RVs. He's working on checking out locations and accepts submissions. His goal is for a directory of places that are really equipped to handle both RVs and offer Wi-Fi, not just those who say they're RV friendly but you can't drive through (a key need) or get Wi-Fi unless you're at the central facility doing your laundry. There's an alternative interface to the site that lets you specify a start and end point and see all the stops along the way. iPass now supports 3G: The Sierra Wireless AirCard 580 can be supported using iPassConnect, the front-end software that iPass sells to corporate customers for their roaming employees to have access to tens of thousands of hotspots and hundreds of thousands of dial-up numbers worldwide. Adding 1xRTT and EVDO in the U.S. means that one more component of mobile data is now swept under a centrally managed and metered plan. Yet another Wi-Fi detector enters the fray: The Zyxel AG-225H Wi-Fi Finder puts all its discovered information in a single LCD screen, which is far superior than the scrolling option in the Canary Wireless Digital Hotspotter (see review). I haven't tested the Zyxel unit, but it detects 802.11a, b, and g networks, including MIMO and beamforming signals, and is a USB 2.0 802.11a/b/g Wi-Fi adapter. It's just $99. Intel has moved from quietly lobbying legislators to sending advisers to all-in involvement: Intel stands to make a few bucks by encouraging more Internet access given their variety of businesses, and the future potential they hope to pull out of mobile WiMax base stations and adapters in their laptops. Digital Communities launched this week with 13 municipalities involved. Cisco, Dell, IBM, and SAP are also involved. This isn't just a U.S. operation. ZDnet reports on the cities: Cleveland, Ohio; Corpus Christi, Texas; Philadelphia; Portland, Ore.; Duesseldorf, Germany; Jerusalem, Israel; Taipei, Taiwan, are among the urban communities participating in Intel's project. Other participants are Mangaratiba, in Rio de Janeiro, Brazil; Gyor, Hungary; Principality of Monaco; Seoul, South Korea; Osaka, Japan; and Westminster in London. The press release for the project talks about a variety of goals: to help 13 "pilot" communities design, develop and deploy comprehensive solutions and services to enhance government efficiency, promote economic growth, foster greater community satisfaction and bridge the digital divide. The applications range from automating mobile workers such as meter readers and building inspectors to increasing the safety and enhancing resource management of first responders by remotely monitoring vehicle location to enhancing parent, teacher collaboration for improved student success. Interestingly, Muniwireless.com is cited in the release as part of the educational efforts for communities. It's interesting to see how one person can make a difference to a project of this scale. Esme Vos has been dedicated. I don't always agree with her stance--I often do--but regardless, she's producing large amounts of research, first-hand reporting, and clearly stated opinions that must be respected. The 200 Mbps spec has been approved by the HomePlug Powerline Alliance board: HomePlug currently operates at 14 Mbps over home electrical wiring. This was fast enough to compete with 10 Mbps Ethernet and 11 Mbps 802.11b Wi-Fi, but is distinctly last century now. This new spec will appear in products starting early next year, and should be a great alternative to Ethernet for installing a wired backbone for a home Wi-Fi network. I've long suggested HomePlug as an alternative to Ethernet for home networks in which speed wasn't the biggest criterion. What If Google Gave Everyone Pi? I'm mixing stories here: Om Malik speculates that Google's efforts to lease dark fiber and buy direct telecom capacity isn't just about them saving infrastructure money, but also about them reaching their users directly. He asks, what if Google gave Wi-Fi to everyone for free? They might easily afford it. Besides their huge free cash flow and their huge GAAP-style earnings and their huge IPO, there's a secondary offering coming of INT((π - 3) * 100,000,000) shares to raise another $4 billion. With four billion more bucks, subsidizing Wi-Fi through the U.S. (or most of the industrialized world) would be a large line item. But could it reap them enough return in increased ad dollars through localization? Probably not. It's better for them to let ISP's and WISP's and others run the end-user infrastructure, and bear all the cost and risk. Continental Airlines turns to its prestigious membership: The Presidents Club comprises Continental Airlines flyers willing to pony up hundreds of dollars a year or piles of frequent flyer milers (more likely for heavy-mileage business travelers) to have a quiet, comfortable place to sit. Continental is offering these desirable folk free Wi-Fi in contrast to several other airlines which provide T-Mobile service at a fee for members. Continental sent around email to this group, which probably includes some relatively influential sorts and at least businesspeople with interest in retaining a critical amenity, asking them to comment on the Boston-Logan conflict. Massport wants Continental's signal off to avoid a contractual conflict with its designated Wi-Fi provider from whom Continental can purchase service. Continental believes FCC regulations and statements restrict the usage of unlicensed spectrum strictly to the FCC. Continental states this pretty fairly: We believe Federal Communications Commission (FCC) regulations give us the right to provide our own seamless service, which is free, and do not require you or us to pay fees to Massport's vendor to have wireless Internet access in our Presidents Clubs. Of course, the free part is less relevant: Continental could pay for service and offer it for free. The principle here is whether individual landlords and municipal authorities have the right to restrict use of unlicensed spectrum. The FCC has said no before; Massport is working hard to find reasons to get around that "no," such as invoking security and interference. Wayport is an infrastructure builder, not a reseller, and they've built 10,000 Wi-Fi hotspots: Six thousand of these locations are under Wayport's direct management at McDonald's, IHOP, Hertz, and elsewhere; the remaining are built for companies like SBC. They installed 7,000 hotspots in the last year. I visited Wayport's Austin, Texas, headquarters in March, and saw a company that was poised for some serious growth from manufacturing to customer support to back-office operations. They had 2.2 million connections in the previous quarter alone on the 6,000 network locations it operates directly. Who's Hot This Week? San Francisco; Pasadena (Not); Philadelphia Narrows; Palakkode, India; Kutztown, Penn. San Francisco announces TechConnect citywide wireless plan: Didn't I ask that news be kept to a minimum while I was on vacation? And SF chose this moment to release its plan. The city will offer up its network for bid to nonprofits and private enterprise. The initial proposal is a request for information and comment, but the bid will apparently be awarded based on a response, and deployment would start a few months after the deadline of Sept. 28. However, the key metric here is 1 Mbps connections, not the 3 to 6 Mbps that cable and DSL now offer routinely in major metro areas (but not to every home in those areas), and the 10 to 20 Mpbs that's coming soon over copper and much higher speeds in certain effectively redlined areas. Pasadena won't spend public dollars on Wi-Fi: The council says it would cost millions and only aid those with laptops. Vendors obviously didn't sell it well: Wi-Fi bridges are being used widely to bring municipal Wi-Fi from the outside to residential desktop users. Ah, well. The city will keep spending to put free Wi-Fi in libraries and elsewhere. They're looking to find a private vendor for a municipal network to bear the fiscal risk. Philadelphia has narrowed candidates for building the citywide Wi-Fi network: EarthLink and HP consortiums are two remaining. Palakkode, India, models computer centers linked wirelessly: The goal is to unwire 600,000 villages in two years, which is remarked as unlikely in the article. But potentially over 200,000 villages will receive a combination of non- and for-profit systems. Because the post is so unreliable, the article alleges, among other benefits to citizens are Internet-based bill presentment: you can't reliably pay your electrical bill through the mail in rural villages. Kutztown, Penn., builds state's only municipal network: The town will build and operate the network municipally without a private partner, making it what the town believes is the first and only--due to legislation--municipal wireless network in the state. The town already has full fiber-optic coverage; the wireless will be just another layer. It's just 1.6 square miles in area. Posted by Glenn Fleishman at 7:30 PM | Permanent Link | Categories: Who's Hot Today? The Car Whisperer, a Bluetooth tool to broadcast audio to poorly secured wireless systems, hit the NY Times: The story's got a good hook. Many Bluetooth systems, including some that are tied into automobile audio systems for hands-free cell talking, use 0000 or 1234 for the passcode, or rely on a weak key length for few combinations. The Car Whisperer is a proof of concept to alert manufacturers to the problem. We're taking a brief holiday here: We'll be back late next week with more news about wireless in general and Wi-Fi in specific while our crack staff--me and Nancy--take our continentally separate vacations. Don't do anything newsworthy while we're gone. Coeur d'Alene tribe puts Wi-Fi across entire reservation: The tribe's IT director, Valerie Fast Horse--an appropriate name for someone building networks--likens reservation-wide Wi-Fi to the coming of the horse to Native Americans. She's hoping for a large-scale change in the commerce and lives of folks who live there. Vivato is installing their large-panel phase-array antennas; their production offices aren't far away, located in Spokane, Wash.
Posted by Glenn Fleishman at 12:26 PM | Permanent Link | Categories: Who's Hot Today? Solar panels power Wi-Fi equipment for hotspots: In Boulder, Colo., Lumin Innovative Products has deployed a set of its sunspots (why didn't they call it this?) at Pearl Street Mall. Five hours of direct sun can charge the unit for a 72-hour run period. Even partial light, or, they claim, moonlight can generate a trickle of power. The company would like some homeland security money, clearly. Wellington Airport adds baggage-handling Wi-Fi: They will have the operational network up by the end of the month, and are considering adding public access Wi-Fi later. Posted by Glenn Fleishman at 11:01 AM | Permanent Link | Categories: Who's Hot Today? If anything could make people turn on basic security on their home networks, this story should: A man convicted of cyberextortion hid his traces by driving around and attaching to unprotected networks in Virginia and Maryland. He would lift account information passing in the clear (or possibly through attacks on the computers connected to those networks) and use those accounts to carry out his extortion demands. He's been convicted and is awaiting sentencing. I imagine there's a scholarly article in how warchalking went from the brain of Matt Jones into the public noösphere and then was entirely commodified: Warchalking was supposed to be a way for folks to tag locations with open or closed marks--even a way to advertise that you were offering Wi-Fi as an individual. The only time I've ever seen a warchalk symbol has been on a business card or a piece of corporate signage. My editorial and advertising partner JiWire built the warchalk symbol into their logo. Now the ultimate step is Krystal's restaurant, which is adding free Wi-Fi to 243 corporate stores and as many of the 180 franchisees who will pony up for it. Their symbol? The spat between Massport (Boston-Logan) and Continental reminded me of how I got started covering Wi-Fi in the first place: Back in late 2000, I was trying out Apple's 802.11b-based AirPort system and having my mind blown. I pitched The New York Times on a feature about Internet access in public places over Wi-Fi and they bit. I researched the story in December and January, talking to all of the several extent companies at the time. This Forbes article predated me by months: June 13, 2000, was the date it ran. It focused on Larry Brilliant, who had founded The Well 15 years before then, and who was CEO of SoftNet. Brilliant received investments from PCCW, Nokia, CMGI (the folks who bought AltaVista from Compaq), and Compaq itself. T heir Aerzone subsidiary, not called that in the Forbes piece, was geared up to launch in October 2000. The article notes something I'd never seen put together before: Nokia's early rollouts in Vancouver (B.C. ), Ottawa, and Denver were partnered with SoftNet. SoftNet pulled the plug on Aerzone in December, three days after I had interviewed the CMO of the division, despite having signed contracts from multiple airlines to deploy service. SoftNet was publicly traded at the time; I can't find a clear story of what happened to them, but they're essentially invisible now, having run through at least the $129 million invested by PCCW (noted in one news story). Nokia backed out of its airport deals not much later. They found service providers to run Vancouver, and finished building the network at Denver--but it took almost another year, well into 2002, for AT&T Wireless to step up and run an expensive service at that airport. Ottawa eventually shut down its Wi-Fi until relatively recently. Brilliant reappeared in 2002 with Cometa, a company that bragged about building 20,000 access points in two years. The initial press release made clear what later news stories did not: Intel Capital, AT&T Broadband, and IBM Global Services were involved. Intel put in money alongside 3i and Apex; AT&T and IBM were committed to providing services. This was never AT&T + IBM + Intel, despite all coverage to the contrary. This Time article makes it sound like that, to be sure. But here's a much more aggressively skeptical interview by Xeni Jardin. By March, Brilliant was out--he's an international health expert and said he thought he might be called into duty over bio-warfare at any time--and Gary Weis of AT&T was in. By May 2004, Cometa shut down, never having built a network with significant locations or scale. CMGI went on to smaller and worse things, now focusing on software. Their corporate history ends in 2002, for some reason. PCCW saw its fortunes dwindle as the dotcom implosion occurred, and now focuses its efforts on a large range of telecommunications services in Asia. SoftNet's current Web site is owned by Integrated WiFi, Inc., an integrator. The closing line of the story is really the kicker and it shows the optimism (and how much money was flowing) in Sept. 2000: "Such complications will no doubt be straightened out, probably within a year to 18 months. Then Internet access for business travelers will truly be brilliant." Over at Mobile Pipeline, I've reviewed the HWL2 from Hawking: I'm not very pleased. It's a good high-gain USB adapter, but its Wi-Fi detection function doesn't offer anything that several newer, better devices have, and its software for control is terrible. I prefer the RangeMax USB 2.0 adapter from NetGear that's $10 to $20 more, but it's just a USB Wi-Fi adapter and its Video54 technology for beamforming works quite well in picking up distant 802.11b and 802.11g signals. Why use high gain when you can use smart tech? Switching to a higher-gain antenna means that you're letting a weak receiver or transmitter listen more carefully. Using beamforming and MIMO means that you're letting multiple antennas distinguish a signal more clearly or form a signal more coherently. Southlake, Texas, allots $72,846 for public locations, public safety: The town is carefully avoiding treading on private companies' territory, however, and will offer free Wi-Fi in public buildings; more broadly, only to police and public safety. Service will be in place by October in parks, the library, and other locations. It was a pretty widely known secret that Cafe.com was looking for a buyer: ICOA bought its 40 outlets across Southern California. Cafe.com put locations in Denny's, IHOP, and Dunkin Donuts, and the press release and general sense indicates that ICOA is buying those relationships in the hopes of expanding into more locations. The release notes that Denny's has 1,600 locations, IHOP 1,100 pancake houses, and Dunkin Donuts 4,400 donutaterias. Intel sends its soldiers into the field: These advisers are advisers in the same sense that military advisers offer advice. They may not go into battle themselves, but they provide critical strategic advice to win the war. Intel plans to make another fortune from fixed and especially mobile WiMax, and they need to wrest the future of broadband wireless from the hands of cellular carriers into their own. When I interviewed a senior Intel executive about Centrino back at its introduction in April 2003, he spoke about a near-term--certainly less than two year--development in which Centrino's Wi-Fi component would develop into a hybrid cellular data and Wi-Fi contraption that would allow seamless, ubiquitous roaming. We now have domestic 3G networks that are approach big-city ubiquity--by the end of this year, or in early 2006, most cities will have one to three choices for high-speed mobile cellular data. Where's the cell card in Intel laptops? Obviously the cellular companies decided they wanted to own their own future, so Intel is taking it from them. If they can't put cell modems into laptops, they'll insert mobile WiMax, and, in the same sweep, produce revenue from base stations and customer equipment. Mobile WiMax moves customers and dollars from expensive cellular networks to less expensive but more diverse and widespread--and possibly overlapping and competitive--networks operated by large and small firms alike. The diversity and extend of the deployment to come puts Intel into the supplier catbird seat. They are trying to become the dominant force in mobile WiMax. Continental Airlines filed a petition with the FCC arguing that Massport has no authority to demand that the airline turn off its lounge Wi-Fi: The FCC has already issued clarification (June 2004) that unlicensed spectrum rules are its exclusive domain of enforcement, and that landlords and others may not control the airwaves. I have heard since then that many landlords have rewritten leases to give them this explicit control; these provisions probably aren't enforceable. The FCC is asking for comments. I expect that it will come down hard on Continental's side because otherwise it would allow individuals, corporations, and municipal entities the right to control federal telecommunications policy. iPass customers can roam onto KT's locations: The 500,000 active users of iPass's aggregated dial-up, wired, and Wi-Fi network can access the 14,000 locations in one of South Korea's two enormous hotspot deployments. KT requires 802.1X for authentication, which iPass supports. Last year, KT offered iPass to its customers; this just closes the loop with bidirectional access and aggregation. iPass says they have 23,000 hotspots active in their current footprint in 52 countries. This will push them to 37,000 when activated. The bragging rights associated with total hotspot count is starting to matter. iPass saw its stock drop when it turned in reduced profits as dial-up revenue sinks while broadband revenue, including both wired and Wi-Fi income, increases. The broadband sector of its revenue is up from $450,000 in Q2 2004 to $2.1 million in the most recent quarter. This is a big quarter over quarter rise, though, with only $1.4 million collected in Q1 2005. Total revenue was $43.1 million, down a million from Q1 2005. The company continues to be profitable, but is experiencing a drop in earnings and revenue, which makes this continued transition into broadband forming a majority of their income a painful one. The stock is at about one third of its IPO price, but the company maintains a very high cash-on-hand balance and a solid market capitalization. The DefCon WiFi Shootout exceeded 125 miles this year with the winning entry: But it's pretty clear from reading both their equipment list and their reasoning for their effective power emissions that they were in violation of several FCC rules. So you can't say that it was a winning WiFi Shootout, but a winning entry that used illegally high-powered, side-node interferring wireless communications in violation of Part 15. On the SOCALWUG list, there's the beginning of a long discussion initiated by Jim Thompson (NetGate, formerly at Wayport, Vivato, Musenki, etc.) about how their claimed use of Part 97 rules (amateur radio) is probably impossible, and their side-node interference clearly illegal. I suggested on another list that perhaps the FCC is invited to be part of the long-shot competition next year to see what the legal distance for Part 15 devices can be! The Overlake Hospital Medical Center in Bellevue uses Wi-Fi across the campus to great effect, Forbes writes: The hospital has 2 the the 8th power beds, which is appropriate given its proximity to Microsoft. The campus used Airespace gear to unwire about 95 percent of its 19-acre campus. They've aggressively added VoIP to deal with roaming personnel, including a substantial Vocera deployment. They went paperless in January, and they're working to make patient and medication ID available through handheld barcode scanners. Doctors have Tablet PCs in the ER, while emergency nurses use computers on wheels. Patients and guests have access to the public network, which saw 250 users in the two weeks after a soft launch. The Bluetooth SIG, the trade association for the technology, had an open house in Bellevue, Wash.: Not far from Microsoft's world headquarters, the Bluetooth SIG--now run by an ex-Softie--is in downtown Bellevue. Several reporters were invited for an overview of the state of Bluetooth, its future plans, and some hands-on examination. My colleague Tricia Duryea wrote up a summary for The Seattle Times. Two tidbits I walked away with. First, the issue of pushing security upgrades in Bluetooth out to devices in the field is being given much more attention. With five million devices with Bluetooth embedded shipping every week, one might hope that would be the case. The mechanisms aren't all in place, but concepts such as pushing Bluetooth firmware upgrades over a cell network aren't infeasible. The other is just how cool integrated Bluetooth can be. The folks at the SIG demoed a car with integrated Bluetooth. The onboard system can handle up to five separate cell phone pairings at a time. 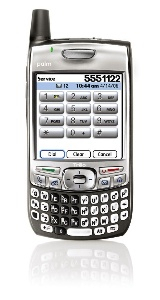 When an incoming call arrives, the stereo system is muted, and caller ID is displayed on the LCD. You can pick up the phone for hands' free talk from the steering wheel. Now I believe that driving while talking on a cell phone in any form is a bad idea given the studies that seem to prove this consistently; but a hands' free system is a good way to go even when you're pulled over. Auckland, New Zealand, adds Wi-Fi to airport: The first pass will be for operational purposes, but public Wi-Fi access will start up in a few months. Washoe County, Nevada: The Incline Village Library has added free Wi-Fi. Seven Meadows development, Katy, Texas, puts Wi-Fi across 1,000 acres: A master-planned community will have Wi-Fi as an amenity across its terrain. Other communities are also adding Wi-Fi in part or whole. West Edmonton Mall, Alberta: The Canadian mall, the size of 48 city blocks, has Wi-Fi throughout its 800 stores, 110 eating establishments, and indoor amusement part. The service is for fee, and there's a location-enabled portion. The Wi-Fi will be used for both public and operational purposes. Posted by Glenn Fleishman at 1:51 PM | Permanent Link | Categories: Who's Hot Today?